So the ceremony has taken place and you're ready to sit down with your guests to eat, drink, be merry and celebrate your new status of husband and wife. This is the first time that you will all sit down to eat together, with the happy couple as head of the table. For some larger gatherings it may also be the only time that you will all get together in this way, so it's important that your arrangements give off the right impression - and a lasting one. By selecting the right place cards that reflect your personal sense of style and occasion, you can ensure that your guests will remember your wedding fondly for years to come. Some couples prefer to use fun and frivolous items to bring a sense of feasting and partying to the occasion, once the solemnity of the wedding ceremony is over. Some couples prefer to keep things formal and high-brow, and others like to use the occasion and its finer details to give a backward nod to their heritage - choosing designs that hark back to their ancestors, or are special to them for some reason. Like most wedding details, it's down to you what you want, and how you want your day to be remembered. Whatever you choose, try to make it special by choosing something unique that shows you've put a lot of thought into it. The last thing you want to happen is for your guests to wonder where your sense of style has gone when they arrive for the post-ceremony feast. There are many different types and styles of place cards, and although they may seem like one of the tiniest details of the day - it is often these small things that make the biggest impression. To put it simply, there's no point in having the best silver, the best crockery and the most delicious food if there has been little thought put into the table decorations or the seating arrangements. Unfortunately, it's a fact of life that people always remember the things that went wrong over what went right, and what stuck out like a sore thumb over what fitted in perfectly. So by spending time to think through the smaller details can often have a really positive impact on the overall impression people take away of your big day. So how do you go about choosing your place cards? First of all, you need to think about the type of wedding you are having. This will affect the options that you have as you want all the finer details to be in keeping with the rest of the day. For example, if you're having a small, intimate gathering of close friends arranged on a tight budget, the home made place-cards with a PC and printer option may well suit you perfectly, and be the perfect informal and inexpensive answer. So place cards can be formal, informal, simple, ornate or contemporary. Traditionally, they have been made from paper, or card, and have had the guests names written or engraved on them in whichever style the bride and groom chose. However, in recent years, the contemporary place cards have become very popular - a large part of which is down to their versatility. A popular twist of recent years is to include the place-card as part of the wedding favours. This can be done in a number of ways and can reduce costs for those on a tight budget. 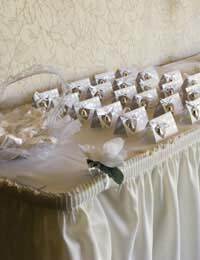 As many wedding guests take home their place cards as a reminder of the happy day, this can be a perfect answer and a great way to keep costs down, without breaking etiquette. Choosing some tiny yet detailed photograph frames to house the place-cards gives people a pretty favour and a perfect keepsake of the wedding day. Pewter is suitably elegant and frames come in many different shapes - hearts, flowers, cars, castles, churches and so can be varied along a theme or all the same (remember for varied designs, make sure that couples don't end up each with the same frame). Those who don't want to keep the place-card can then use the frame to house a photograph from the big day after the event. You could also consider personalising your menus, each having a guests name across the top. This combines the difficulty of choosing menus and place cards, and gives each guest's afternoon a nice, personal touch.